I've been planning to write something about this topic since the beginning of my journey with this mobile application called Snapcart PH yet I want to make sure that I'm scratching my own itch and be able to give an honest review. This app popped out on my Instagram dashboard. At first, it was just a sponsored post and to me, it isn't worth looking at. But then few months after (yep, few months! ), I saw one of my blogger friend, a mom, posted about this and that she got money from it. Then I looked for reviews and write-ups. And since I had enough information, I downloaded it for free and joined those thousands using it. Snapcart Philippines was launched last August 2016. So then I started keeping receipts and sometimes, I ask my boyfriend for his receipt when we go shopping. It was to test if this platform is worth considering and can be recommended. This experiment lasted for four months, slower than what I've expected. Here are some pages of Snapcart that I find essential. The dashboard. Upon opening the app, this is the first thing you'll see on your gadget. Your status, your balance and the snap button to capture your receipts. Obviously, this is my personal favorite. After taking pictures, I can see here immediately if my receipt was approved or not because the balance increases or stays the same. When I notice that the amount of my balance increases, this is the next page I'm into, the notification page. It shows the amount you had from your recent receipt snaps. And if ever your receipt got rejected, you can also see here the reason why. And in case your receipt got rejected, but you think it should NOT be rejected, you need to check your ID and send a message to their customer support. Rejection can be avoided. Just make sure that you snapped your receipt as clear as possible and as complete as possible (that means from top to bottom). There are some cases that my snaps are unreasonably rejected. That's no problem, I just report them with the ID number and they give me cashback after. Just be patient when talking to them. It takes them some time before they reply to an inquiry. The longest one I had was four days. Since I started using the app, I never had a week that I did not snap a receipt. This is part of the experiment, until when will I be able to finally cashout. But then when they added a new feature, like the redemption of load, I was able to use it twice. Minimum amount was Php50 but you need to have atleast Php55 in your balance. My other bank redemption was a success too! I linked my BPI account and they deposited it on my account after 15 business days. Yep. That's a long time. It says in the app that the maximum days of waiting is up to 7 days only. But no, don't be mislead. I needed to follow up mine everyday after that 7 days and then I finally had my cashout. Waiting game, they say. This last picture is what I hate the most. I was banned and I won't be able to cashout unless they removed my account from being warned. The worse case is being blocked, meaning, I won't be able to snap again with the account I am using. But I did not panic. Few days after, the warning was removed and I received an email stating "The system mistakenly flagged users who are not supposed to be warned." 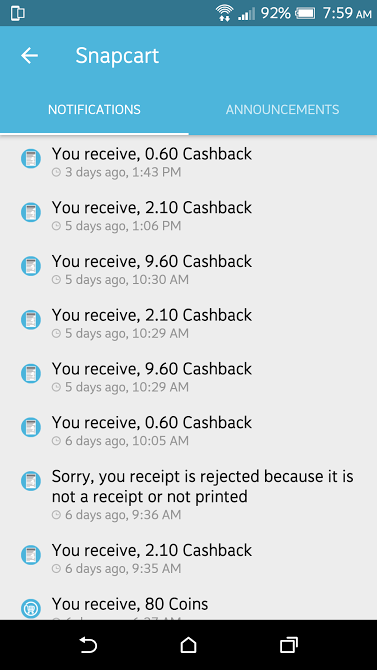 Apologizing for the mistake that happened, they even send cashback compensation. Awesome! The application is user-friendly. I personally like the color, hey it's blue! Don't blame me. :D There are also games and surveys that can add points which can add cash. The customer support was kind to answer all my questions but they took a lot of time. Cashout takes time too. Instead of 7 business days, it was 15 business days for me, and a month for others. This experiment went well for the past months. It was a good source of extra money if you have time and patience. You can try it for yourself if you may. Happy snapping! Snapcart App stopped their mobile load redemption. Bank cashout is the only option they have. Use a Google Account registered in the Philippines, otherwise it will not work. 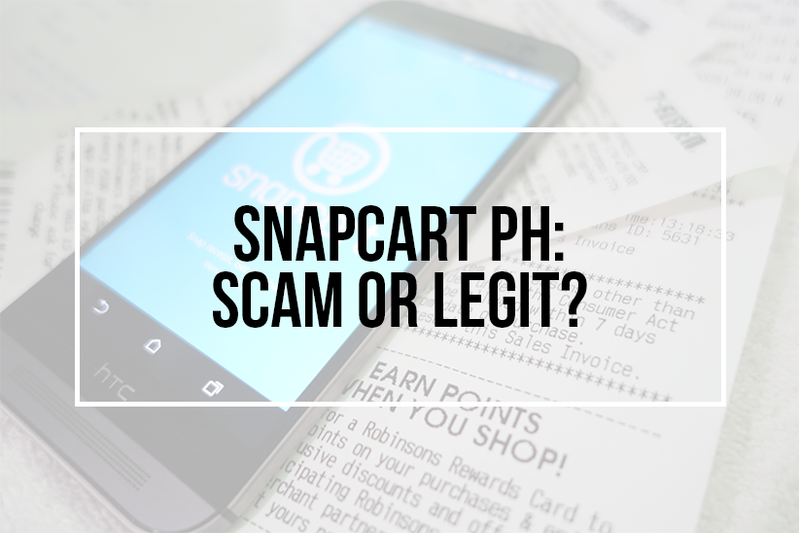 Disclaimer: I am not affiliated with Snapcart Philippines. This write up is solely based on my own experience. Thanks for dropping Ochi. This is not a sponsored post. This is solely my review about this app. However, I do have some and they are located here -> Tag: Sponsored Post PR staffs just contact me through email. I don't have an idea how they reach my blog, but it is nice since it gives me few cash. Interesting! Kaso parang nakakaadik magshopping kapag ganito hahaha! i think thats not a problem. They only accept grocery shopping receipts. Hi!Just wanna know kung pwedeng magcash out kahit walang bank account. or Credit Card? I already earned 350php.Please notice me. Hi, you cannot cashout if you do not have a bank account. It is the only way they send the cash. You can use other's account, but please mind the risks. Thank you! Hello Charina, you cannot link your BPI account until you reached the minimum cashout amount of Php220. When you're ready to cashout, a form requesting for your bank account will then appear on the cashout page. Hope this helps. Thank you for dropping! ako rin hindi ko ma acces na yung acccount ko. sabi ACCOUNT NOT REGISTERED. pero sabi ng CS nila na active naman daw ang account ko. well, as usual paikot ikot lang at walang nangyari. RIP snapcart account. baka SCAM ito kaya ganon. na reject din ang cashout ko bago nagkaganyan ang account ko. susmaryosep. Ako nga sumunod ako sa patakaran nila na receipts lang sa bahay ang gagamitin..tapis malalaman mo after a few weeks na blocked na yung account mo. So wala talaga ako na cashout. Twice na nangyari sa akin yun kaya I think SCAM talaga sila. Same thing happened to me twice. Nung una pinalitan ko nalang yung password ko since I think that was the only way. The second time happened and I cannot even change my password, saying that there's an error occurred. I contacted their CS and they said na my account is still active and I should just change pass na lang daw but when I replied to them that I cannot change my password they never contacted me again. I tried contacting them several times but no reply. Dont waste your time, they will not pay you. I requested a 55 phone credit cashout which said was completed. I never received the credits, and when asking in support they just refunded the 55 rater than credit my phone. And now they have removed my option to request the 55 phone credit cashout. My options now are the 305 and 505 cashout. They must think im dumb enough to actually go for the next cashout option which ofcouse they will not credit aswell once i try. Scam..
That's sad to hear Sir. I had 2 bank cashouts and some phone credit cashout and they always go smoothly. And I noticed also that their processes doesnt take that much time anymore. Hey, how long does it takes to cash out through phone credit?. Is it automatically adds to your load balance in your phone.?. Hi! Paano kung ayaw ko siya i-cash out tru bank? Saan ko pwede makita yung cash out tru phone credit? Bank na lang kasi yung option na nakikita ko. Hi Lawyerruby, there is only 2 options in cashing out. either the bank, or phone credit. always make sure that your app is updated. Otherwise, you can contact them directly through the app itself or email. ask ko lng po..lahat ba ng receipt pwede or grocery lng ang pwede? Snapcart accepts grocery, cosmetics, drug/pharmacy and fresh food receipts. Ibe heard about apps like these before but always wondered if they actually worked. Thanks for the information, might give it a go! Thinking of.. "anong gagawin ng Snapcart with these receipt photos?" the whole time I was reading this. Haha! They will use these receipt to study the trend of the industry on what most of the people shop at grocery based on age brackets. They are a marketing team. Or business can use them for tax purposes? I started snapping last week. Since you've tried it for quite some time already (and you said that CS takes awhile to answer), I might as well ask you (in case you know it). The cash out option will not show unless you reached the minimum to cash out of atleast 55php. Php55 for phone credit and Php250 for bank transfer. Hi Rose, phone credit doesn't work anymore. Snapcart removed it last year. The only way to cashout is through Bank transfer. I cashed out php1220 3weeks ago. Still no money was deposited on my bank account and im beginning to think it is a scam until i read your post. Whoa. That's a lot of cashout. I think it is better to cash your money out little by little. Since receipt has a chance of being rejected, I think cashout plays the same. But let's hope that it will not be that way. What if po kung walang bank account pwde ko ba ipasok s ibang account? sample sa bank account ng sister ko. Hi.. I'm having problems now with cash out. This is my first time to try cashing out for phone credits. It was automatically deducted from my balance but the load hasn't arrived yet 😢. Gladly I was able to screen shot each step while it process the cash out. At least I have my evidence when I contact the CS. It happened to me once too. Smart had a problem that time, which I am not aware of. They deducted the amount on my balance and upon seeing that, I panicked, messaging them that the load didn't reached me. They told asked me details about the cashout but after few minutes, my balance came back. It's better if you will message the CS asap, and tell them what happened. Hi, how long bago na lift yung ban? Ganyan din issue ng account ko. Just saw it now pero wala pa rin naman akong nareceive na email from them. Hi, I think it was five to six days before they finally removed that red flag. But it was a mistake and some of my friends had the same problem. If it will lapse to a week, you need to tell them it was a mistake banning you. I do not have a sure answer for this question, sorry po, but both my BPI and UnionBank worked. nagdownload ako ng snapcart na app from.playstore..pero indonesian siya..paano po ba makuha ang snapcart ph? pls respect my inquiries. 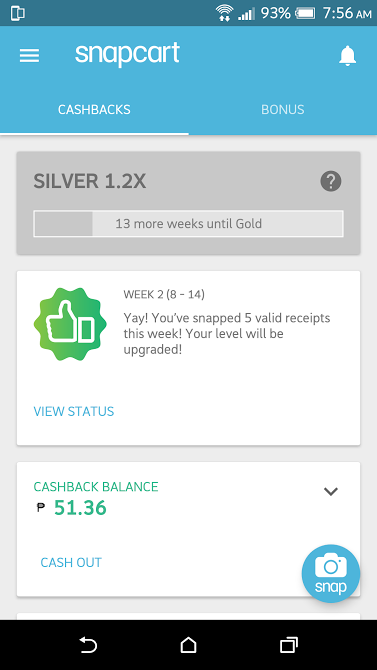 Hi, I am an android user too po and there's only one Snapcart app at playstore. It has a name of "Snapcart - Snap Receipt, Get Cashback!" Make sure to use an email created in the Philippines, otherwise it will not work (can't download). what donu mean email crrated in the philippines? is gmail valid for this? Yes, gmail is valid. What I mean is, an email account created abroad po. It will not work if you created an account when you were abroad and still, you're using it here in the Philippines. My friends have US created emails and those emails wont work. Hello! I love reading your blog, this one is so helpful!! Anyway, Pwede ho kayang mag cashout kahit walang bank account? Kase nasa verge na ako ng pwede na i cashout yung amount, pwede ho kaya yun? but no bank account, you can claim it as cellular load. There are only 2 ways po to redeem, load or bank transfer. ..how can i redeem load phone credits when that option is gone?..i didnt have bank account, so how can i cash out? There's no other way now to cash out than having it deposited in your bank account. How long ang warning period? Daily dn kae ko snap and di daw normal shopping behavior yun. Mg iisang bwan n di ako mkacash out. Warning period depends po. You should contact their CS with regards to your concern. Hi, it doesn't matter if your receipt bears your name or not. I always snap 7 Eleven receipts and it works fine. Just take pictures of the receipt of the items that you bought (not the receipt transaction of your credit card). i'm trying to cash out for the first time but i can no longer find the option for bank transfer. The option i can see is one icon for "Bank Transfer & Phone Credit" and another icon for zalora voucher. but when i click on the first one, it only directs me to an option for phone credit...hmmm dati nung tinitesting ko pumunta sa cashout na page, nakita ko pa yung option nung bank transfer... anybody who would know whats going on? The cash out option will not show unless you reached the minimum to cash out of atleast 55php while bank transfer is Php220. 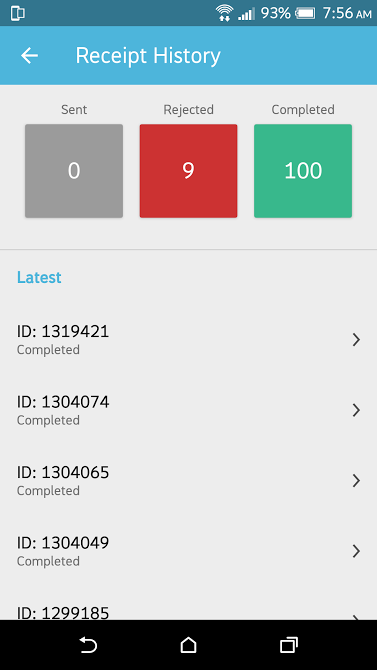 And make sure that your application is updated, I am using Version 9.0.5 at the moment. 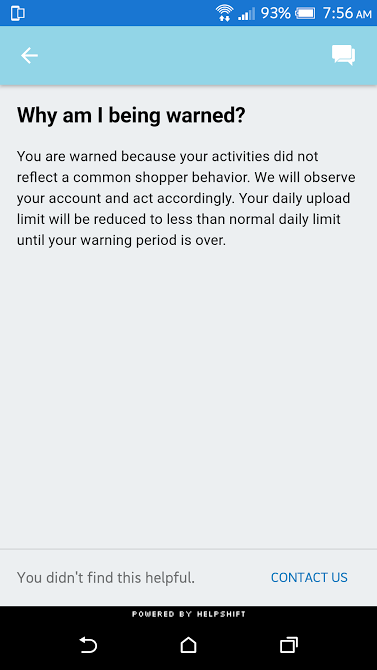 This is a scam.I have been warned for almost 2 weeks now.they said my shopping behavior is not normal.and would not let me cash out my earnings.and they are telling me that they dont know when will the system remove my warning.but they still want me to upload receipts. what kind of receipts are allowed? They are becoming a scammer nowadays, if they aren't one already. They will warn their subscribers for no valid reason. They'd say that you are not following "a normal shopper behaviour" and will gave you a warning which will last until they say so. Who in the world dictates what a "normal shopping behaviour" is? What if you have the means to buy things, or if the store is right next to your house? Wouldn't it be normal to use common sense to buy things that you need at the time that you'd need them? Or to buy at a store where it is most convenient to you? That's why it's called a convenient store, for Pete's sake! And that's also why you'd see 7-11s popping up at every corner here in Manila. They have also removed options to cash out on most of their subscribers. Mine included. Maybe this only happens to those accounts that they see would get a high amount of cash out. Don't you even get to that point where you'd expect that you can rely on their Customer Service Reps. They're senseless and stupid. Especially, this sick robot called Basha. same disappointing experience for me. The first time I was blocked, I gave them an explanation for the bulk purchases I made due to our huge household. They accepted my explanation and even apologized which made me re-use the app again. But they again blocked me for supposedly suspicious activity as I made another round of bulk purchases. I mentioned to them they are free to check my pantry so that they can verify BUT they just made their own erroneous judgment without sufficient due diligence. VERY DISAPPOINTING. Avoid getting hooked as they continue to use the information you have uploaded even if they block you and they don't issue your cashbank once you are blocked. JUST AVOID THE HASSLE altogether as Snapcart is a SCAM! I had the same experience too. I just bought bed foam from a grocery store worth P3000+ and Snapcart sent me a meager P0.5 cashback instead of P30.I get the feeling they're trying to skimp on the cashback as much as they can. It's kinda hard to mistake P3000+ purchase as a P0-P100 purchase, don't you think? Hanggang ilang araw po para malaman kung accepted yung receipt??? There's no specific number of days po before they accept the receipt. Yung saken po kasi minsan a week, minsan less than a week. To check whether a site is legit usually, I do follow a simple checklist to see how well they do, especially when I need to part money with the site; 1) Does the site have a current SSL certificate? 2) Use WhoisXY.com to check the whois information and check whether the contact information matches with the one in the website. 3) In the domain contact details, is there a valid email address. 4) Is there a valid phone number visible, and does it work ? 5) Go through review about them using Unmaskparasites.com and check whether they are scam free. If I am satisfied with the result then I purchase a small priced article and if it is delivered safely and promptly then I go to purchase my desired product. You also can follow the steps that I do...In general, anyone who is trying to do legitimate business on the web will go out of their way to try and make it clear that they are legitimate. So if a site has not even done the bare basics to give customers enough confidence to buy they're products, then it is almost certainly some sort of scam. kaso matagal. My last cashout was recorded on my snapcart account few weeks after I received it. Please do check you bank transactions as well. How kong is the warning period? I was warned this morning. I'm ony 24 weeks to become platinum. Sayang naman account ko if mablock. Matagal maupgrade. Contact mo customer support nila para mabilis. Even before I always contact their CS, especially kapag may narereject akong receipts na alam kong valid naman. Very responsive ang CS nila. Pero about dito sa warning period twice na akong nagmessage sa support pero hindi sila sumasagot. Give them more time this time maybe po. I don't know how is the fastest way to reach them but I know everything with them takes time. I am so mad at the moment. I've been using SC since May. Madalas load ang cashout ko. Tried once through my BPI account 7 days after pumasok. Pero ngayon ito yung pangalawang beses pa lang nag cashout ako ng 500 same pa rin thru my bpi 3 days after I got the message na completed na daw pero nung tiningnan ko account ko wala naman pumasok. And its also the first time na antagal nila nagreply sa concern ko. That actually happened to me as well with my BPI account. Then after that first cashout and receiving nothing, I decided to change my bank to UnionBank. And I just received my cashout yesterday, and it works pretty good with that account. Ahh! I remember the time when BPI was hacked, and that time, I did my very first cashout. That actually answers why! And yeah, the phone credit option isn't there anymore. Thank you for your blog abt this, im seeing some scam comments though I want to try it on my own. By the way, may i ask if what domain and website hosting are you using for your blog? Have you tried also accessing your website or working on it outside the Philippines? Im planning to launch my own website as well but I need a hosting which also accessible outside our country, Thank you and more power to your site. hi ask ko lang kung mag cashout ka thru bank, tama ba na ilalagay mo lang ung bank account mo dun sa bank account na matatagpuan sa profile? Ask ko lang po paano kaya kung ang nalagay ko na account number is yung card number mbabalik b ung kinash out ko? 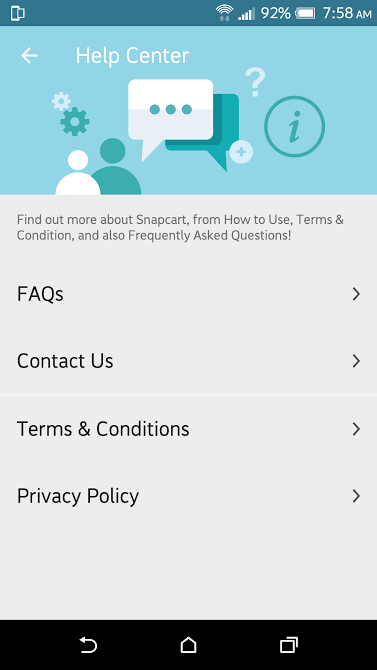 Hi Diane, regarding this matter, please contact Snapcart directly through the app. I hope they can do something about it po. Just want to ask paano ko ma i follow-up yung cash out ko halos 13 working days na wala pa din sa account ko. First cash out ko ito. You can reach them through the Contact us option sa application or you can simply send them an email. Gumagamit ako nito pero, mejo nakakatakot na magbigay ng mga information dito sa app na ito. Kinukuha lahat ng app yung informations, hindi naman masama pero baka soon magkaproblem lahat ng info na nalagay eh magamit. Nakakaano lang, may bagong update ng info para makapagplay sa Snapstastic. Somehow scary, daming info na pinapasagot kahit sabihin parang 'research purpose something' lang. Mag ingat! sa cash out di na magagamit for loading? kasi min of 220 ang cash out.. ?? They recently removed the load option and I think that's a mistake they did. I hope they will bring it back again. SCAM! Started using this app a few months back. I even accumulated a total amount close to 1,500. Until last november, i got a warning and was unable to cashout. After about a month and some email complaining about the warning, my account was removed from the warning period. So I made my very first cashout. Cashout was made last Dec 26. While patiently waiting for them to transfer my cashback, I GOT BLOCKED!! I will never reach silver if I was doing an unneccessary shoppers behavior. So i think this is a SCAM!! Your damn right! This is a SCAM! It will only get your personal details and later you won't be able to access your account and you cashout will be blocked for no reason at all. Problem has been more than 2 months now. I haven't even cashed out - not even once. Now my account is suddenly "NOT REGISTERED". As you have confirmed, my account is active and should be working. However, I am still getting error message that says "Account is not registered". Please see attached .jpeg screenshot. I already followed your all your guidance I don't think there's anything more. Kindly fix this defect in Snapcart. Hi! I like how you blog tbe application, functionalities, pictures with explanation but it did not answer if the app is a legit website and not created yo phish bank information. Why do they have such app and what is their gain? Sana na discuss dn kung anong ginagawa nila sa mga receipts at i explain bakit nila ginagawa iyon. Pero maganda ung pagkaka present mo. Thanks. Hi mga ilang weeks bago natanggal ang warning sign?at ano ang dpat kong gwin para matanggal ang warning sign? I am not sure how long it takes actually. You can contact their customer rep for situations like this. That's a big amount! :O I am sorry to hear that. This is why I don't let my cashout reach a thousand or more, I only stick to their minimum and request for a cashout immediately. You can reach their customer care via Snapcart app or you can visit their office at BGC. Exactly what happened to me. Uninstalled. Waste of time. This app is a real scam!!! I registered a month ago and I collected more than 500php then their telling me that I am blocked because of 1 receipt but they want you to continue snapping it's been 2 weeks of checking after that I can't sign in on my account.I am telling you stay away from this app cause they will just use your receipt for their own good, such a waste of time...before installing it check the comments in play store to see more of the users angry comments!!! good day ma'am.. paano po ba mag report ng receipt na rejected? yong sa ID po, where do i input the ID? You can report it via "Help Center", then "Contact Us", then "Receipt". ..What if Naabot ko na po yung Minimum na Cashout required Nila? Anu po yung hihingin ng App para mapadala yung pera sakin? Thanks in Advance! Bakit ganun, nag ipon ako ng receipts. Hindi ako nagcash out kasi iniipon ko, nung umabot ng more than 1k binlock ako???? SCAM ! This app does not give cash out to majority users. Just read the reviews in social media. It also blocks users who attempt to cashout big amount or those who already are at higher level such as silver or gold. The worst thing is they do not provide any valid reason for such blocking you and accusing you for suspicious shopping behavior. Bottomline is that you must be careful using your personal information on this app such as your name, phone number, and your bank account. These syndicates have many ways to track you down and steal valuable information from you for their personal gain. SCAMMERS, CRIMINALS and FRAUDSTERS will never play fair and will never giveaway FREE LUNCH to anyone. Agree this is a SCAM!! WARNING. I tried to cashout 800 Pesos and suddenly I could not login back. I emailed Snapcart and got the reply that I am blocked but no reason provided. I am so disappointed. I guess people are right. I was victimized too by this SCAM app. after this app got all my personal information including my bank account nunber, now I am scared what they can do to me. Please read all reviews before trying out this app.. AT YOUR OWN RISK. I reached platinum and after my last cash out, they suddenly placed my account on warning. i‘Ve emailed their support several times and got no resolution. Very disappointing. Wala na ang cashout option for Phone Credit. Ayokong e link ang bank account ko, just to be safe. ok lang ba kung old grocery receipts? prior to the date you start snapcart? It should be snapped in 3 days, otherwise it will only be rejected. ano pong maximum receipt in a day? 3 receipts per day only. I've been using this app for more than a year. So far I, was able to cash out Php5100. (5 cash outs, Php1020 per cash out). It took them less than a week to deposit to my BDO account. They send it to me thru dragonpay. Snapcart won't allow to upload receipts anymore. This is their cheap trick when they see users getting max cashout consistently. I hate to use this app as they never treated us fairly with so many complaints on their app policy and inability to provide a more transparent service. For all those inconveniences, blocking for no reason, banking cashbacks for no reason, delays in cashback, I had enough. THIS APP IS A SCAM after all. Remember they have your personal details and your BANK ACCOUNT NUMBER. BE CAREFUL! I got degraded weeks far back and now I am unable to upload receipts. It keeps giving me an error message that receipt cannot be uploaded. I reached out to their support team but is always given a generic OR robotic unsensible response - I don't think they even read thru the content of the message to answer concerns by users. SNAPCART HAS THE WORST CUSTOMER SERVICE I GUARANTEE YOU WILL BE CONVINCED SOONER OR LATER THAT SNAPCART IS A LEGITIMATE SCAM! Limited lang for 3 receipts a day. any amount from 2K and up will get the same rebage of 15 pesos for newbies. Hi! Is Snapcart safe especially for our bank accounts? Just want to make sure before I cash out. :) So far, I enjoy using this app. Hello! Any bank account po ba para maka ag cash out? hi, safe naman po ba syang i link sa bank account?? and if wala pong own bank accont, pwedeng gumami ng ibang bank account like sa parents??? im using this app since july 30. so far this January I try to cashout but got rejected 3x but I don't lose hope. Try ko pa din sa 4th try ko na go naman siya at the next day nasa account ko na. so legit siya so far.